Let's make some tacos - Steak, Bacon and Veggie Tacos! 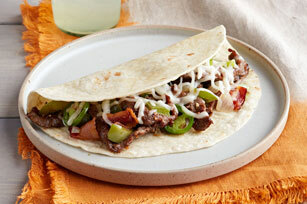 Seasoned steak mingles with roasted peppers and bacon for this classic Mexican taco presentation. Cut steak across the grain into thin strips; toss with black pepper. Refrigerate 30 min. Meanwhile, cook and stir bacon in large heavy skillet on medium heat until crisp. Remove bacon from skillet with slotted spoon; drain on paper towels. Discard drippings from skillet. Heat same skillet on high heat. Add half the steak strips; cook 2 min. or until evenly browned, stirring frequently. Remove from skillet. Place in medium bowl; cover to keep warm. Repeat with remaining steak strips. Add sweet peppers, jalapeño peppers, onions and garlic to skillet; cook 5 min. or until vegetables are crisp-tender, stirring constantly. Stir in steak and bacon; cook and stir 3 min. Remove from heat. Top meat mixture with cheese; cover. Let stand until melted. Serve wrapped in tortillas. Serve these delicious tacos with a side of hot cooked long-grain rice.